This section comprises the natural area of the Garden. Roughly half the Garden is natural, consisting of an indigenous forest with hiking trails on the hillside, a grassland garden and the midlands meadow on the plateau above the forest. 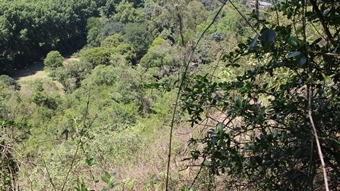 Many indigenous plant and animal species can be found in this area. These include the Crowned Eagle (Stephanoaëtus coronatus), blue duiker (Philantomba monticola), green-banded swallowtail butterfly (Papilio nireus lyaeus), pirate butterfly (Catacroptera cloanthe cloanthe), dwarf chameleon(Bradypodion melanocephalum) and Natal wild banana (Strelitzia nicolai). 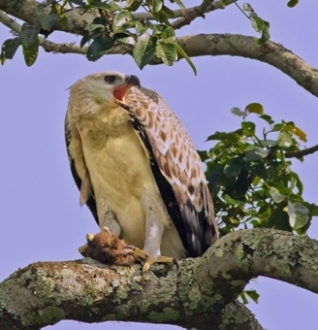 The magnificent Crowned Eagles are frequent visitors to the Garden and use it as their hunting ground. They have been seen swooping down and carrying away blue duiker on occasion. As they nest nearby, the young are frequently seen in the Garden. 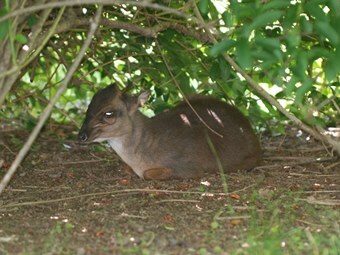 The blue duiker is the smallest antelope in southern Africa. These shy antelope live in the natural forest but are sometimes seen grazing on the midlands meadow. Common and widespread in wooded areas and suburban gardens, the beautiful green-banded swallowtail butterfly is seen in the Garden most often between November and February. The pirate butterfly is one of the earliest butterflies seen in spring. It is strongly territorial and sits on patches of bare earth, chasing away intruders. One of the Garden’s special reptile residents is the black-headed dwarf chameleon. This tiny, 10 cm-long creature can sometimes be seen sitting at the ends of branches or grass stems along the forest margin at night. 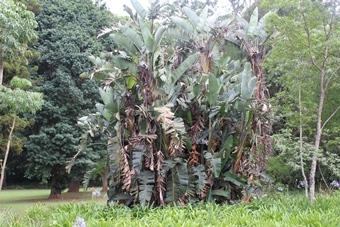 The Natal wild banana is characteristic of dune vegetation along the eastern seaboard. The copious nectar produced by the crane flowers attracts birds. Easily grown from seed, this very decorative tree needs protection from frost when young.